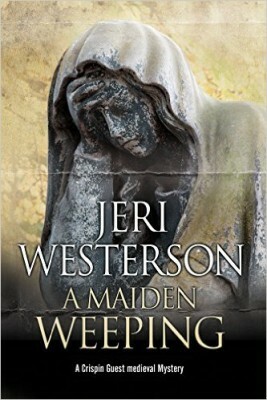 Details at the end of this post on how to win an e-book copy of A Maiden Weeping, and links to purchase it. A Maiden Weeping is the ninth medieval noir mystery by Jeri Westerson featuring tracker Crispin Guest. The disgraced former knight has made a life for himself as a Tracker, finding lost items and solving crimes. This book opens with Crispin at his favorite tavern in London, the Boar’s Tusk. He has had too much to drink when a stranger shoves a bulging money pouch at him and tells him that a certain woman must be killed that night. Realizing that he has been mistaken for a hired killer, Crispin uses the instructions inside the pouch to locate and warn the target, Elizabeth le Porter. She ignores his warnings and instead they end up in bed together. When Crispin wakes up he finds her dead and flees the scene for fear that he will be charged with murder unless he can find the real killer. Unfortunately, witnesses saw him fleeing the scene and he ends up arrested anyway, leaving his apprentice Jack his only hope to find the real killer and prove his innocence. Jack heads out to find a lawyer for Crispin and ends up with Nigellus Cobmartin, who doesn’t have a lot of experience or a great track record, but is very determined to help. While Nigellus tries to delay the trial, Jack tries to find the truth. Another relic, the Virgin’s Tears, seem to be at the heart of the murder, but there are differing opinions as to who it belongs to. Jack also enlists the help of a young lady he has taken a fancy to, as well a character that I loved in the last book, cross dressing prostitute John Rykener. In the end, Crispin ends up being able to help them put all the final pieces together to find the real killer and prove his innocence. While I missed seeing as much of Crispin at work, it was nice to see how much Jack has grown up and how much he has learned about investigating. I also enjoyed getting to know some new characters–which I hope will show up in future books. As always, there were plenty of twists and turns and medieval action. If you enjoy a good mystery, interesting characters, mixed together with an awesome setting, don’t miss A Maiden Weeping. This is one of my favorite series! To enter to win a copy of A Maiden Weeping, simply email KRL at krlcontests@gmail[dot]com by replacing the [dot] with a period, and with the subject line “weeping,” or comment on this article. A winner will be chosen September 3, 2016. U.S. residents only. If entering via email please include your mailing address. What a fascinating introduction. A new to me series, and I evidently have been missing something terrific. “A Maiden Weeping” sounds like an interesting read. Looking forward to reading. I love books by Jeri Westerson and always enjoy the Crispin books. So happy she continues to be published. To win this book, A MAIDEN WEEPING, would be a dream!! Thanks for the opportunity. Thanks for the chance to win this interesting book. Can’t wait to read more of the series.